Posted May 25th, 2014 by Padraic. It’s often one of the first things children are taught when learning to swim: keep your fingers together and make your hand like a paddle. 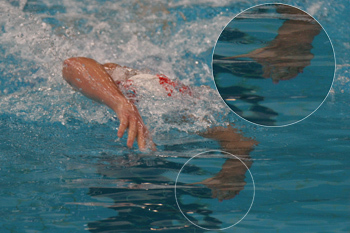 When the alternative in a beginner is fingers splayed wide apart this can be a sensible approach, but when a greater degree of proficiency is reached and swimmers seek every possible technical advantage from their stroke, is it still valid? Intuitively it seems like it should be; after all if you consider your hand working like an oar or a paddle, then those pieces of equipment don’t have holes in, so why should gaps in your hand be a good idea? However, the analogy breaks down partly because rowing in particular has been able to increase their propulsive areas by adopting larger blades, mainly with the move from traditional macon style blades to the now ubiquitous cleaver. It’s not possible to make your hands physically larger, but by keeping your fingers a small distance apart you can make them behave in the water as though they were bigger. Two scientific studies (linked below), one using physical models and one using computational fluid dynamics both concluded that a small finger spacing with fingers at approximately 10 degrees (equating to a finger spacing at the tip of about 10-14mm depending on finger length) actually allowed an effective increase in propulsive area and hence greater forward force to be generated. This occurs because of the viscosity of water and the turbulent flow through the small gaps between the fingers which prevents a loss of force and means the gaps act more like a solid face. Conveniently the 10 degree spacing is for most people around the natural relaxed hand position so requires little thought as to finger position. Added to this, a relaxed hand position has ancillary, if minor, benefits by reducing tension in the forearm. This may help with control of the hand position and reduce muscle fatigue. The photos to the right show two of the world’s leading freestylers, Fran Halsall and 2008 Olympic 400m champion Tae Hwan Park. At the catch both can be seen to have relaxed hands with fingers apart. Note however that Park’s fingers come together at the end of his stroke – this may be deliberate or a consequence of the relaxation in his hand allowing his fingers to come together naturally as his arm position and the muscle tension in his forearms change through the stroke. 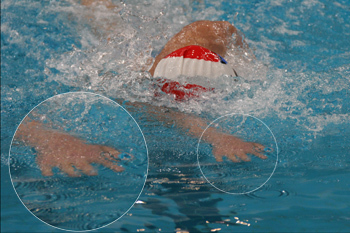 In conclusion, top swimmers keep their fingers apart and it has been shown to increase propulsive force which makes it worth trying. However like all things, personal preference counts for a lot so swimmers should try it and settle on what works best for their stroke.